Try different flavors of yogurt. Divide the sliced banana pieces between two plates. Place 2 tablespoons of yogurt onto each plate. Place 1 tablespoon of granola cereal onto each plate. 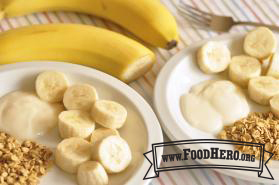 Use fork to pick up a slice of banana and dip into the yogurt, then into the cereal. 1 Comments for "Banana Bobs"
Well this is a kid favorite! I enjoyed this with 20 kids at an afterschool healthy snacks club with elementary students. We practiced cutting skills on the banana, tried greek and regular yogurt and voted on it, and then for the cereal we actually made the Food Hero Skillet Granola recipe. For sure a hit! Every kiddo wanted to take the recipes home to their parents!